Now long out of print, John Dunning's Tune in Yesterday was the definitive one-volume reference on old-time radio broadcasting. Now, in On the Air, Dunning has completely rethought this classic work, reorganizing the material and doubling its coverage, to provide a richer and more informative account of radio's golden age. Here are some 1,500 radio shows presented in alphabetical order. The great programs of the '30s, '40s, and '50s are all here--Amos 'n' Andy, Fibber McGee and Molly, The Lone Ranger, Major Bowes' Original Amateur Hour, and The March of Time, to name only a few. For each, Dunning provides a complete broadcast history, with the timeslot, the network, and the name of the show's advertisers. He also lists major cast members, announcers, producers, directors, writers, and sound effects people--even the show's theme song. There are also umbrella entries, such as "News Broadcasts," which features an engaging essay on radio news, with capsule biographies of major broadcasters, such as Lowell Thomas and Edward R. Murrow. Equally important, Dunning provides a fascinating account of each program, taking us behind the scenes to capture the feel of the performance, such as the ghastly sounds of Lights Out (a horror drama where heads rolled and bones crunched), and providing engrossing biographies of the main people involved in the show. 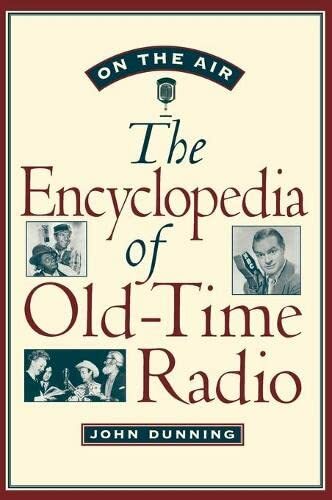 A wonderful read for everyone who loves old-time radio, On the Air is a must purchase for all radio hobbyists and anyone interested in 20th-century American history. It is an essential reference work for libraries and radio stations. Here are some 1,500 radio shows presented in alphabetical order. The great programs of the '30s, '40s, and '50s are all here - Amos 'n' Andy, Fibber McGee and Molly, The Lone Ranger, Major Bowes' Original Amateur Hour, and The March of Time, to name only a few. For each, Dunning provides a complete broadcast history, with the timeslot, the network, and the name of the show's sponsors. He lists major cast members, announcers, producers, directors, writers, and sound effects people - even the show's theme song. There are also umbrella entries, such as "News Broadcasts", which features an engaging essay on radio news, with capsule biographies of major broadcasters like Lowell Thomas and Edward R. Murrow. Equally important, Dunning provides a fascinating account of each program, taking us behind the scenes to capture the feel of the performance, such as the ghastly sounds of Lights Out (a horror drama where heads rolled and bones crunched), and providing engrossing biographies of the main people involved in the show.